After the jump, Kolla makes her case for a Food and Flowers Freedom Act. If it sounds silly, it might be, but so are some of our zoning ordinances here in Los Angeles. 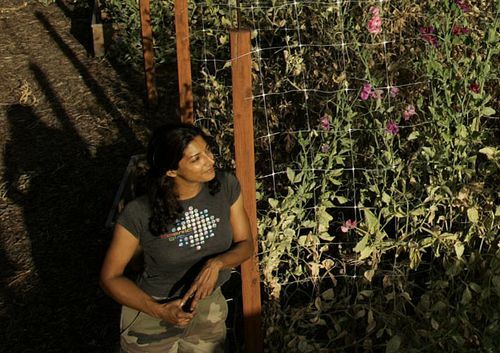 Kolla is pursuing the act because her urban flower garden, Silver Lake Farms, was nearly run out of business last spring by a litigious neighbor who took exception to the idea that Kolla was growing flowers to sell. Disclosure obligations require me to point out that I am aware of this feud because Kolla called me in as a consultant over how to end it last spring. After visiting her garden and finding it to be a water conservation model, impeccably maintained and invisible to her complaining neighbor, I wrote a site report in defense of the operation to city officials. In it I speculated that what most likely motivated the neighbor’s campaign was not disruption from her flower growing operation, but anxiety about a sliver of land running behind his property that is owned by Kolla and might be developed by her if she so chose. I did not know Kolla beforehand and have not become friends with her since. I waived any payment for the inspection and report, though I do think that Kolla is responsible for the loofa sponge that appeared in my shoulder bag after the visit. It is sheer admiration for her commitment to the most forward-thinking garden practices, her determination and her guts that prompts me to post the following item. In 1946, a Los Angeles municipal code known as the Truck Gardening Ordinance was written to allow the growing of vegetables in a residential (R1) zone for sale off-site. What this means, however, is that it is prohibited for city dwellers in R1 zones to grow fruits, nuts, flowers or seedlings and sell them off-site – at local farmers’ markets for example. Furthermore, no one at City Hall can agree on what Truck Gardening is. To find out who is your local councilmember, click here. I hope the “Food and Flowers Freedom Act “gets passed. I sold flowers to the local florist,and one of the selling points were that they were localy grown and free of pesticides.